Most of the time in the morning all I want is a delicious and easy egg dish that I can whip up in a couple of minutes and will keep me satisfied. 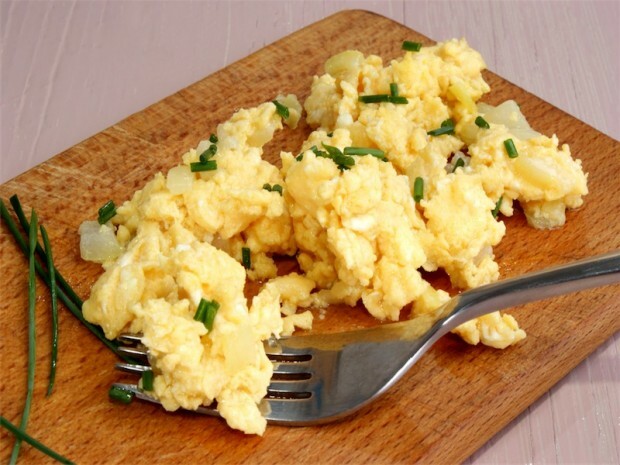 This simple scrambled egg dish is a great recipe to do just that and will work on any phase of the Dukan Diet. You can easily add more protein by adding chicken, lean ham, or lean deli turkey. During the Cruise, Consolidation, or Stabilization Phase consider adding even more veggies. Zucchini, broccoli, or cherry tomatoes taste great in this dish. 1. In a small bowl, mix together the eggs, cream cheese, chives, salt, and pepper. 2. Heat a non-stick pan over medium heat. Spray with cooking spray. Add the egg mixture and scramble. Cook to desired doneness.